Remembering this November the loyal and courageous men and women who served in times of war and following the continuing 1914-1918 Centenary commemorations, here we revisit the evolving role of women during the Great War. Our article of November 2015 considered those who trained as VAD nurses and undertook transport and postal work early on, more becoming ‘munitionettes’ and labouring in heavy industry, particularly from 1915. As the rising death toll overseas fuelled demand for more servicemen, prompting conscription in 1916, so women became indispensable on the Home Front, some eventually being recruited into military units. By 1917 an unprecedented number of British women were in uniform. For centuries, country women had worked on farms, mainly in dairies, keeping poultry, gathering fruit and helping with the harvest, but there persisted long-held prejudices about women in agriculture. Early in the war, County War Agricultural Committees were formed to determine farmers’ needs and plan for maximisation of available resources in each region. In Sussex Lady Denman and the Countess of Chichester were involved in programmes to train local women in land cultivation and help break down traditional barriers. In 1915 the government established the Women’s Forage Corps to deal with the urgent need for horse fodder and the Women’s Forestry Corps to supply wood for use at home and at the Front. By late 1916, the Board of Agriculture recognised that the management of Britain’s fields and forests could critically affect the outcome of the war, and in 1917 the Women’s Land Army (WLA) was established as a full-time female labour force tasked with vital farm work. In East Sussex some WLA members operated alongside the Women’s Forestry Corps, felling trees in Heathfield and also being sent to work in the forests around Tunbridge Wells. The efficient organisation and rigorous training of the Women’s Land Army proved invaluable to wartime land management, although afterwards women lost their farm jobs to men returning from the Front. When the WLA was officially disbanded in 1919, in honour of their valued work in a predominantly rural county, members from East Sussex participated in a medal presentation and ‘stand down’ march through Lewes. Within days of the outbreak of war, the Women’s Emergency Corps (WEC) was founded, welcoming recruits from throughout society and soon boasting an impressive branch network. Working alongside other charities, providing meals, training and various other services, the WEC was the forerunner of the Women’s Legion (WL), formed in July 1915 by the Marchioness of Londonderry, in which over 40,000 women enrolled. As the largest voluntary body supporting the war effort, the WL adopted a quasi-military organisation and uniform comprising belted jacket and skirt, shirt and tie and felt hat with identifying hat badge, yet they had no formal Government or military affiliation. Britain was reluctant to accept women into military organisations, but this changed in 1917 and 1918, when official uniformed women’s military units were established. The Women’s Army Auxiliary Corps (WAAC) was created in January 1917, to release experienced soldiers in rear positions for front line service. It rapidly enrolled thousands of female recruits, the first despatched on 31st March to France, where the French named them ‘Les Tommettes.’ Within a year around 6,000 WAACs served in France, while thousands more worked at home, for example in communications and as cooks, storekeepers, drivers and motor mechanics. 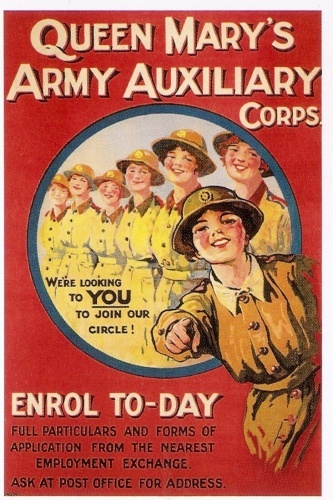 The WAAC was officially renamed the Queen Mary’s Army Auxiliary Corps in April 1918 and new cap badges were issued, but their original khaki gabardine uniforms were retained. Women served in these army corps from 1917 until the QMAAC was disbanded in 1921. Following heavy British naval losses, in November 2017 the Women’s Royal Naval Service (WRNS - or Wrens) was created. ‘Free a man for sea service’ urged the new government recruitment posters depicting determined-looking women in stylish navy blue uniforms. Officers were issued with dashing tricorne hats, although ordinary ratings were unimpressed with their uniforms, which involved ordinary sailor collars and round caps, the unreliable blue fabric dye staining their skin. Initially around 3,000 women were recruited and deployed to shore bases or air stations to perform mainly domestic duties. However, by late 1918 the WRNS numbered around 5,500, many working in roles once thought beyond female capabilities, including sail makers, despatch riders and Intelligence personnel. In April 1918, the Royal Naval Air Service (RNAS) combined with the Royal Flying Corps (RFC) to create the new Royal Air Force (RAF). Both of the earlier organisations had employed women on their air stations, and so as to retain their expertise, a new Women’s Royal Air Force (WRAF) was also created in April 1918, alongside the RAF. Women from the WAAC and WRNS were given the opportunity to transfer, and over 9,000 joined the new WRAF, their numbers swelled by a civilian recruitment drive. The WRAFS covered various indoor and outdoor jobs, from clerks and cooks, to drivers, motor cyclists and mechanics. They were dispatched to RAF bases, initially in Britain, then later, in 1919, to France and Germany.